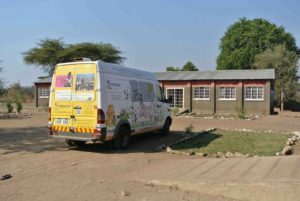 Book Bus George at Uyoba School. But where are all the children? 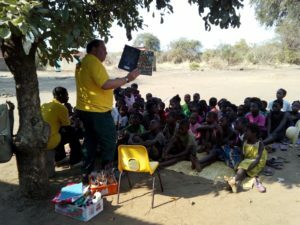 This has been a slightly different Book Bus experience, in that usually the Mfuwe bus travels to multiple schools, and works with different age groups for a relatively short time. 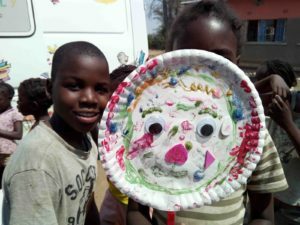 This time, we’ve been based at Uyoba Primary School, taking advantage of their fantastic library facility, and working with a core of the same children over the two weeks, as well as some who have come for a few days, but couldn’t come every day. 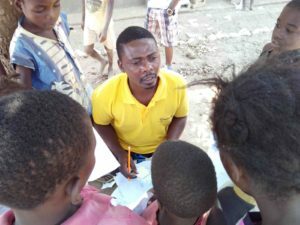 The dedication of some of these children is amazing. There are a small group of girls who’ve been coming late every day. We found out that they’re coming later because they’re walking three miles from home to Uyoba, then the same distance home again at the end. This, remember, during their school holiday, to come to a holiday project. took off around the playground as a lion hunt before discovering a person(! ), running away, and ending up under the covers. This was so successful that the preschool group wanted to do it too, so we repeated it (with less glitter!) with them the next day. A good time was had by all. Over the last week, we’ve developed – almost accidentally – a theme of looking at books which are about being an individual. Giraffes Can’t Dance led to some brilliant pictures of giraffes proving they CAN dance, as long as they have the right music, The Lion Inside by Rachel Bright, with its great Jim Field illustrations, showed the children that “we all have a mouse and a lion inside”, and Elmer, of course, is an elephant who’s different, and comes to accept his differences. Our grand finale is planned to be two giant Elmers (filled from drawing of animals inspired by the Elmer parade, and the colourful animals in ‘Greedy Zebra’), and a drawing of George the bus, filled with pictures of the children (drawn by them), and possibly us too!